It was an absolutely gorgeous day today. 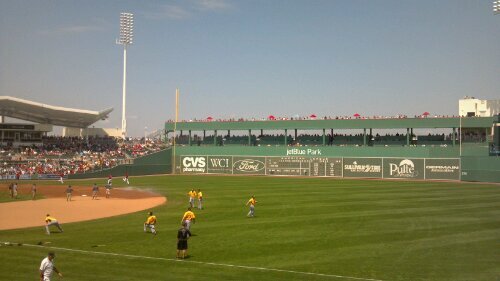 jetBlue park is pretty nice. Mark Melancon looked much stronger, striking out two. Tony Watson showed no ill effects from his injury earlier in camp. Vin Mazzaro was the big surprise of the day with five Ks in two innings. On the offensive side, Garrett Jones hit a mammoth HR to center but everything else was quiet until the 8th. Somehow the Bucs scored four runs even though the only well-struck ball was a Pedro Alvarez homer that went over the bullpens and a grassy area in right field. A classic El Toro bomb. 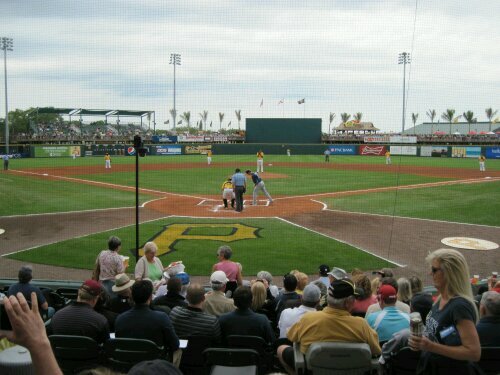 It should also be noted that Russell Martin hit three hard line drives today but each one managed to find a glove. 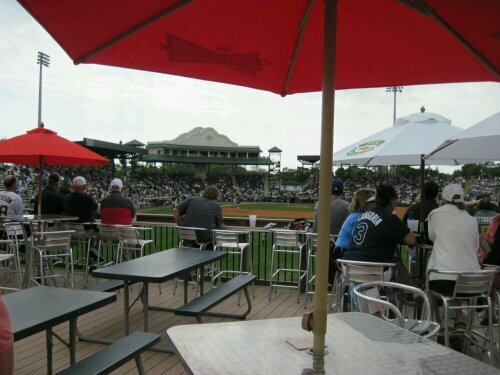 Tomorrow it’s back to McKechnie to put the wraps on my trip. Look for a closing post on Monday or Tuesday. Jeanmar Gomez may actually be useful as the #9 starter. Mike Zagursky pitched his way to the minors. Jason Grilli looked as good as last year. He’ll be fine as closer. Mark Melancon appeared to be guiding his pitches instead if just throwing and trusting his stuff. The bench has a better batting eye than the starters. Three walks and only five Ks today vs two and nine yesterday. Editor’s note: I can’t connect to the hotel wifi, so it looks like it will be phone posts all weekend. Please forgive the lack of links and poor formatting. Jonathan Sanchez took the mound tonight looking to stake a claim to a spot in the rotation. 5 shutout innings with 4 Ks and only 3 baserunners should do it. Other than a two batters in the third, when he walked Lew Ford, then sent him to second on a wild pitch, Sanchez was in control the whole time. This wasn’t against minor leaguers either, as Baltimore had 7 regulars in the lineup. Chris Leroux and Justin Wilson both solid in their relief stints. The offense looked a lot like last year. Eight hits, but never more than one in an inning, and nine Ks. Starling Marte and Neil Walker both reached base twice. 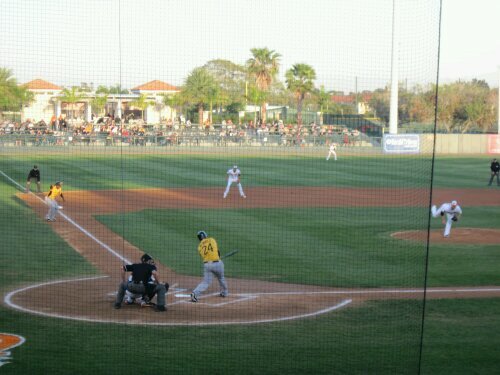 Travis Snider had two hits and two walks, plus made some tricky plays against the twilight sky. On the bad side, Brad Hawpe had a hat trick and clearly disagreed with the umpire on both of his called strikeouts. 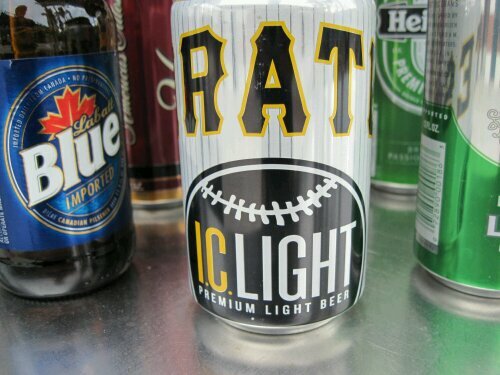 Jose Tabata pinch hit for Hawpe in the ninth when the Pirates were trying to rally but missed a bunt sign and left pinch runner Alex Presley out to dry at second. It would have been nice to win, but all-in-all there were a lot if positive things to take away from the game. I also got to meet Pat Lackey from Whygavs.com, who seemed to be having a good time. Which is really what it’s all about. 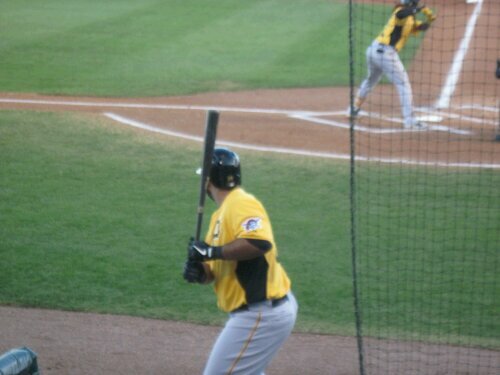 Pedro Alvarez watches Andrew McCutchen at bat. A great night for baseball. 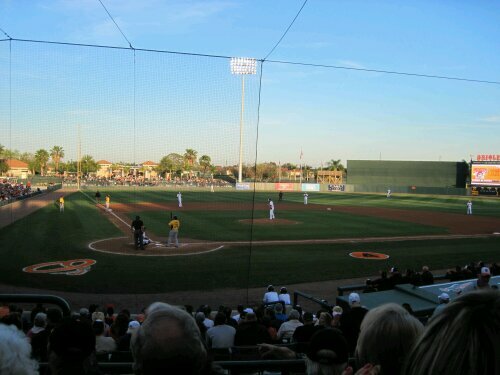 Getting ready to head down to Bradenton for spring training this weekend. If you’ll be at the following games send me a tweet or email and we can try to meet up. Look for pictures and thoughts to be posted all weekend, assuming I can figure out why my wireless card isn’t working or the hotel has an ethernet connection available.